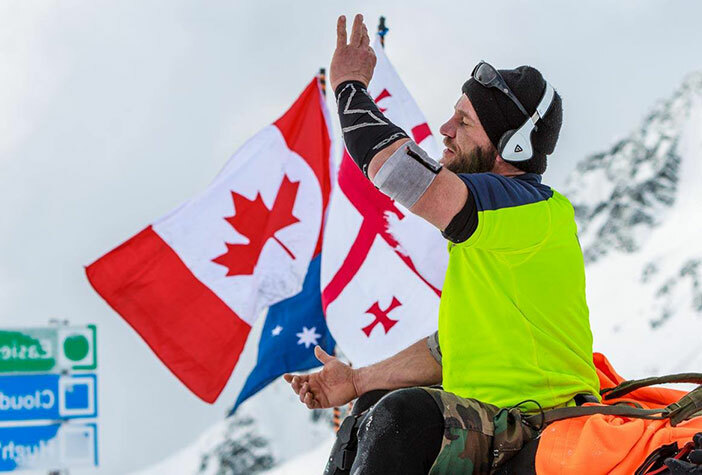 On February 10th, 2018, Terrance Kosikar, the founder of Camp My Way, and his Team of Warriors will undertake the Herculean task of flipping a 400lb tractor tire – end over end – for 24 kilometres in 24 hours around the Stanley Park Seawall in Vancouver, BC. 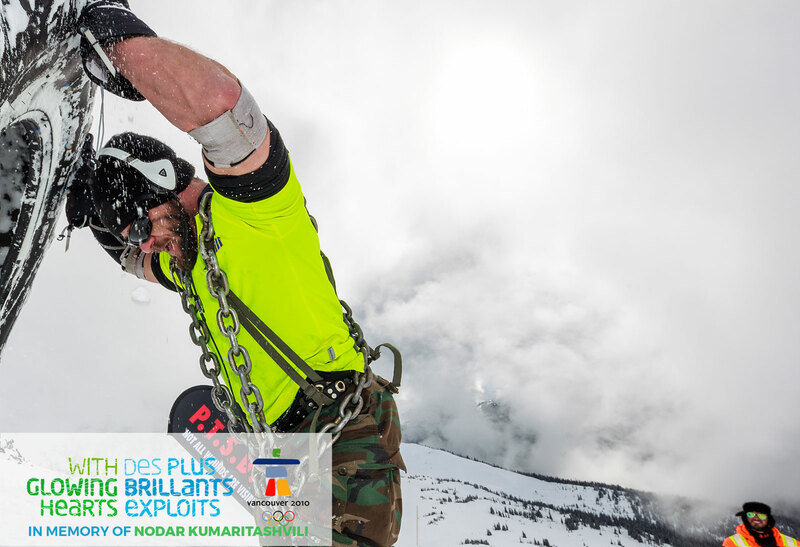 On Feb 13 – 16, Terrance will be back, this time flipping a 400 lb tractor tire up to 7,142 feet on 7th Heaven Summit ( Cloud 9 ) on Blackcomb Mountain while wearing 50 pounds of solid steel chains . Help raise awareness for PTSD for Public Safety Workers and their families. Pledge a dollar for every km Terrance and his Team successfully travels! Eight years ago, on the opening day of the Vancouver 2010 Winter Olympics, a tragic accident resulted in the death of a young Georgian luge athlete, Nodar Kumaritashvili. The first person on the scene of the accident was Terrance Kosikar from Whistler, BC, and a part of him died that day, too. As an Emergency Responder, Kosikar was well-trained in a myriad of life saving techniques, however he was not prepared for the emotional trauma which resulted when he was not able to save the young man’s life. Kosikar developed Post Traumatic Stress Injury (PTSD) and his life spiraled out of control. He lost his career, his family and — as a result of severe depression, anxiety, and substance abuse —Kosikar almost lost his own life. Kosikar fought back against this devastating disorder and, after finding solace in the peace and beauty of the backcountry near Lillooet, BC, Kosikar became determined to share the healing power of nature with others. In 2015, he began a residential wilderness program called Camp My Way to help Emergency Service Providers who are struggling with PTSD to get their lives back and reconnect with their family and friends through teamwork, self-discipline, meditation, exercise, nutrition and sharing positive experiences, in a natural environment. Over the past several years, Kosikar has symbolically demonstrated the struggle of PTSD by flipping a large tractor tire across great distances or up mountains. 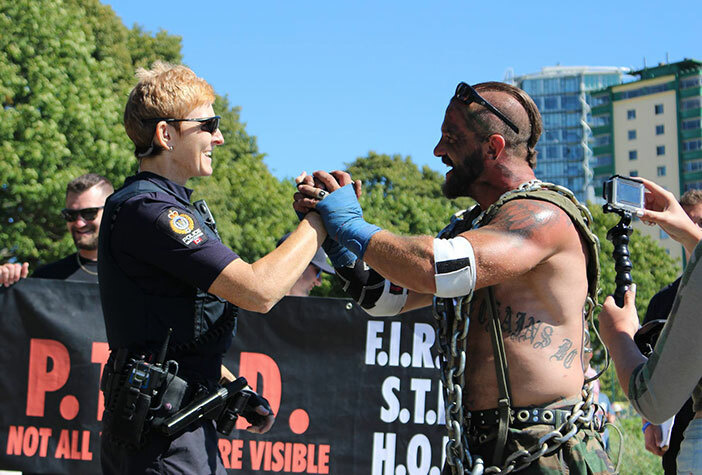 For the fundraising event on February 10th, Kosikar and his team will literally do the heavy lifting by flipping the 400lb tire around the Stanley Park Seawall for 24 kilometres in 24 hours. They are asking friends, family and supporter of Emergency Service Providers and anyone that may have struggled with mental health and substance abuse issues to sponsor the team’s efforts by pledging a donation for each kilometre. Come join us on feb 10th and Feb 13-16th, or track the event live! What happens when I pledge? If you decide to sponsor and support our cause, all you need to do is provide us your email and name below. Camp My Way will then send you an email notification. We will be in touch by email shortly after the event is completed. Together, We can help heal our Emergency service providers. First Responders, Armed Forces Members, and Veterans are more vulnerable to PTSD than traditional citizens resulting in the 10th leading cause of death by suicide. Help us on our mission to help people get their lives back by donating to Camp My Way on GoFundMe.